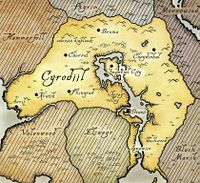 Nibenay is regarded as the soul of Cyrodiil, where the original Cyro-Nordic tribes began to grow culturally and economically separate from Skyrim. During this time, in opposition to the oppression from the Ayleids, the role of the battlemage was conceived, and these mages went on to become the ruling class of the Nibenese people. The Alessian Reformation turned the focus of Eastern productivity towards merchantry, and the Alessian priesthood superseded the battlemages as the cultural leaders. This lasted until the priesthood became too large to support itself, and the Alessian Order collapsed following the resistance of Western Cyrodiil to their doctrines and the subsequent creation of the autonomous Colovian Estates. Nibenay then reverted to its previous battlemage aristocracy, and they have been near the top of Nibenese social standing, right above the merchant nobility, to this day. 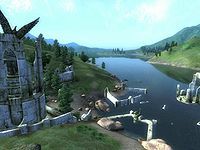 One of the most notable noble families from Nibenay are the Tharns, who have held estates in and around Cheydinhal since the First Era, and have frequently served directly under the Emperors as ministers and battlemages.